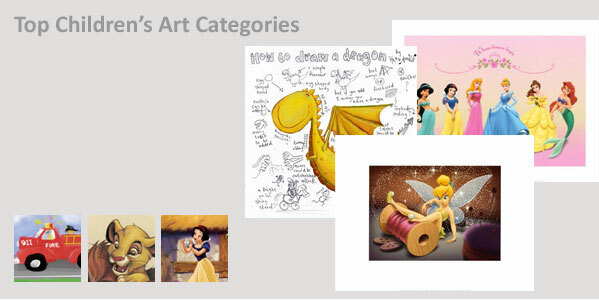 Whether you are looking to decorate a new baby's room, toddler room, or tween bedroom our Children's Art Collection has something for children of all ages. Choose from a wide range of posters and prints such as Disney characters, zoo animals, outer space adventures, and much more. Custom frame the artwork for that perfect finishing touch. Everyone's favorite mouse is in the house. This iconic little mouse and his friends continue to delight children of all ages. Check out Mickey, Donald, Goofy and the rest of the extended Disney family in this fabulous collection of Disney Artwork and posters. If your child is a lover of animals this collection will provide everything you need to make their room a menagerie of fuzzy, feathered and fantastic creatures. View our entire line of animal art from zoo animals to sea urchins and all that is in between. Most every childhood includes a favorite teddy bear. Bring the joy of teddy bears into your decorating style for your child's room. Teddy bear art is perfect for newborn, infant and toddler rooms. Give them art they will cherish and remember for a lifetime. © 2019 ArtPosters.com. All rights reserved.